A. Getting Married in New Jersey? A. Getting Married in New York? Q. Do I need to do anything with my marriage license? A. Don’t forget to bring the marriage license to the ceremony! Don’t write on or alter your marriage license once the Registrar clerk has issued it! Once the ceremony is completed, I will file the license, give you the pink copy, and keep a copy for my permanent records. Q. After the ceremony, how do I get an official copy of my marriage certificate? A. As your wedding officiant, I will mail your marriage license to the local Registrar in the town where you were married. You will need to contact the Registrar of Vital Statistics in the town in which you were married for copies. I will provide you with that contact person’s name and phone number. They will let you know what information they need to send you a copy of your certificate and what the fee is. Q. How about a “pop up wedding” referred by Local Registrars? A. I am registered with many municipal Registrars throughout New Jersey. I offer a simple and easy wedding ceremony. You will need a marriage license, 2 witnesses and an appointment. You can call me at 908-797-9351 and I am usually available with very little advance notice. These wedding are performed at your chosen location and last approximately 15 - 20 minutes. The fee for this service is between $250 and $300 – depending on my travel time. Q. What is Pre-Cana? Do I need to attend it? A. Pre-Cana is a series of classes required by the Catholic Church. You only need Pre-Cana if you are being married within the Catholic Church by a Priest. Q. What happens if you cannot perform my ceremony due to an emergency? A. I work closely with other Ministers, so in the event of a dire emergency, I will be able to fine someone available with experience and a personality that will suit your style, that will be able to perform your ceremony. In fact, in their emergency situations, other ministers often rely on me. A. Most ceremonies last approximately 20-30 minutes but the length depends on what wedding rituals you want in your ceremony. Of course, if you have multiple readings or poems, a Unity Candle, etc. your ceremony will be longer. Your ceremony can be as long or short as you want it to be. Q. When will you arrive for the ceremony? A. Depending on my schedule, I will arrive 60 minutes prior to the start of the ceremony. This is done so that I can take care of my pre-ceremony set up with the maître d or wedding planner. During this time, your witnesses will need to sign the marriage license. Q. What do you wear during the ceremony? A. I generally wear black dress or suit, but I can change my attire to suit your preferences. My attire has no religious affiliation to it. Q. Can I write my own wedding vows/ceremony? A. You can customize your ceremony as you would like. I am also always available to help you with any details and provide you with a diverse selection of material to choose from for your ceremony. Q. What is a Unity Candle? A. A Unity Candle consists of one large pedestal candle that sits in between two smaller taper candles. During the ceremony Mothers of the Bride and Groom, or any other loved ones, will light the two taper candles signifying your current family. You and your fiancé will take the taper candles and light the pedestal candle together, signifying your new family. 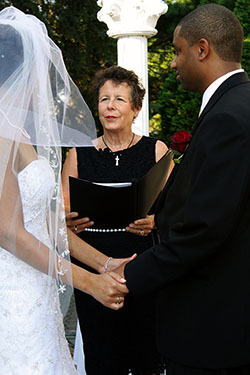 The ceremony can have a religious or non-religious meaning. There are different meanings for the Unity Candles. Q. What is a Rose Ceremony? A. A Rose Ceremony is an older tradition where the Bride and Groom, after taking their vows, exchange a single red rose to each other. It symbolizes their first gift to each other as husband and wife as well as an expression of their love for one another. A section can be added to include your mothers receiving a rose as well. Q. What is a Sand Ceremony? A. A Sand Ceremony is a Hawaiian Tradition that can be used in place of a Unity Candle, especially in beach weddings or outdoor weddings where candles are often difficult to use. It holds a similar meaning as the Unity Candle. Two small containers of sand are combined into one large container by the Bride and Groom, unifying the two. We want you to perform a ceremony for us. What’s next? You can contact me by telephone at 908-797-9351 or contact me via email at sarah@sayidowithsarah.com. I will gather information about you and the type of ceremony that you want, and answer any questions that you have about my services. We would then set up a consultation meeting where we can talk in depth about your ceremony and yourselves. I personalize every ceremony I perform. We want you to perform a ceremony for us. What's next?